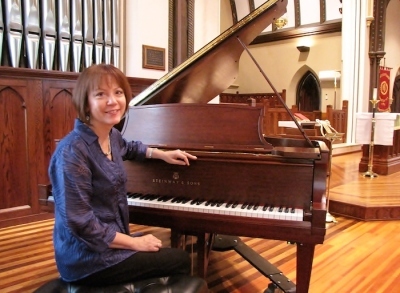 Pianist Diana Greene will be one of the featured performers at a Chamber Music Concert to dedicate the Steinway piano recently donated to Christ Church Newton. Photo courtesy of Christ Church. NEWTON, NJ – On Saturday, September 27th at 7:30 p.m., Christ Church Newton will present an evening of Chamber Music as partial dedication of a rebuilt Steinway piano. The piano is a 1924 Steinway Model “B” finished in African mahogany and has been restored to a near new condition. It was given to the Glory of God and in loving memory of Eugenie Dunstan by her family. The concert will consist of works by Haydn, Chopin, Rachmaninoff, Faure, Duparc, Strauss, Galliard, Glazunov and others. The performers are S. Gregory Shaffer, piano; Lynda Andres, cello, Gerald Tedesco, trumpet; Shannah Timms, soprano; Barbara Garrison, euphonium; Deborah Mello, soprano, Diana Greene, piano; Eric Schaberg, violin; and Joseph Mello, baritone. A free-will donation will be received and a reception will follow in Holley Hall, the building adjacent to the church. Christ Church is located on the corner of Main and Church Streets in Newton, one block south of the Newton Town Square. For additional information about the concert, call Joe Mello at 862-268-4720.